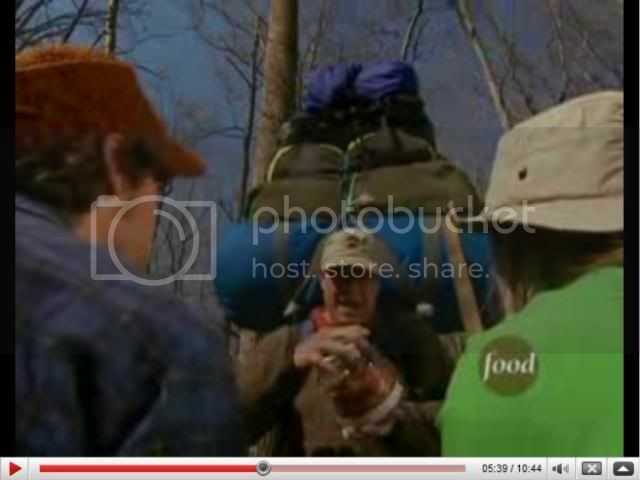 That's Alton Brown of Food Network's Good Eats with His Ultra lite pack. Looks like everything is packed on top of the pack, he must have his portable "kitchen sink" inside the pack! the pack, and He sways when He walks. Then a Man in a Bear Suit chases Him for His trail mix. You can watch the show on youtube if You want. The show is about Drying fruit on a 20" box fan. Allen wrote: The show is about Drying fruit on a 20" box fan. Wish I had thought of that before I bought my dehydrator! LOL! Darren... the taste of the food.... I remember seeing something on Discovery once the nomads actually made biscuits out of camel dung. They must make one hell of a gravy to cover up that taste!!! It's the pinnacle of UL hiking! You put your gear on the camel and the camel carries less weight because you eat its poo for dinner. I have always wondered where they came up with the idea for Metamucil!!! Camel Jockey runs back to group "Guys with this orange flavoring you can't even taste the dung!!!!" I always wondered why they put a photo of a camel on a pack of cigaretts. They even smoke the dung, that's why they made you choke when you inhaled the smoke, arghhh yuck!!!! Wow! What we have seen here? The mule is sitting on the cart and have a rest. So funny.